Once upon a time, there were four brothers. Three of them were highly educated but lacked in common sense. However, the fourthe brother; who was also the youngest; was uneducated but was full of common sense. Once they were passing through a jungle when they saw a carcass of some animal. The three educated brothers applied their knowledge to find out that the carcass belonged to which animal. They used various scientific theories to conclude that it was a lion’s carcass. The eldest brother was an expert in studying skeletons of animals. He assembled the bones to make a complete skeleton of lion. The second brother was an expert in musculature of animals. He assembled the muscles and skin over the skeleton. Now, a complete lion was lying before them but it was still dead. The third brother was an expert in putting back life in a dead animal. He said that it was a great chance for him to prove his expertise. The youngest brother requested them not to make the dead lion alive because it would kill all of them. But none of his brothers listened to him. He said that they could do whatever they wished to but before that, he would like to climb a tree to save his life. While the youngest brother was climbing the tree, his brothers laughed at him called him all sorts of names. 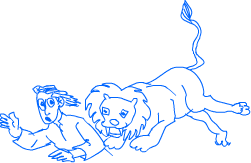 Finally, the lion sprang to life because of some strange magic. The three brothers were highly elated at seeing the success of their knowledge. But their happiness was short lived because the lion immediately killed all of them. Fortunately, the youngest brother was alive because he did not know too much.